Buses drop off workers at the Syncrude Mildred Lake plant, near Fort McKay, Alta., in the early-morning hours of Sept. 16, 2014. Clara Mercer ambles slowly down a gravel road a few kilometres from her home. She is hunting for the bushes that have long provided the indigenous people of northeastern Alberta with staples of their diet. Now a grandmother, she has gathered blueberries and wild cranberries along this ridge since she was a girl. As she walks, she identifies plants with medicinal properties – Labrador tea, stinging nettle and juniper. Her main quarry, however, proves elusive. A year-long project about Fort McMurray, Alta., which has come to be the emblem of Canada’s energy sector – and all the issues that surround it. "There used to be a lot of berries here," she says softly, almost to herself, "but now it's all torn up." An access road and pipeline right-of-way now run straight through the berry patch – and most of what little still grows here in the summer is covered with dust. 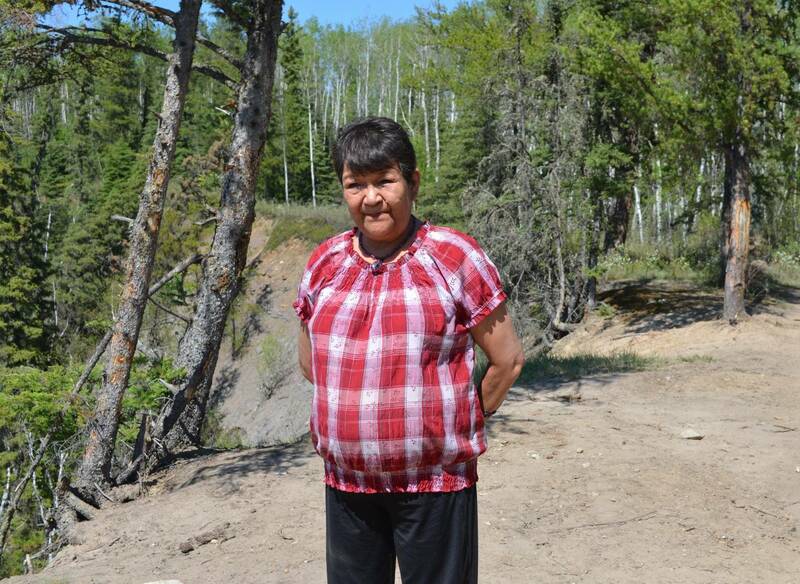 She was born on a trapline, but Ms. Mercer was raised in Fort McKay, and has witnessed, with growing alarm, the dramatic transformation of the hamlet nearly 200 years after it was founded as a trading post. Fort McMurray is closely identified with the vast Alberta oil sands, but tiny Fort McKay lies in the very heart of them. Located 55 kilometres down the Athabasca River, the community of nearly 400 Cree, Dene and Métis people is surrounded, either by the massive pits produced by the strip-mining of sand laden with bitumen, or by smaller operations that extract the oil "in situ" by injecting massive amounts of steam into the ground. All this development provides some residents of Fort McKay (pronounced muh-KYE) with a comfortable living – although it comes at a price. Not only has the land been scarred, many argue that the area's water and wildlife are being poisoned. The oil companies insist that they aren't polluting, and the concerns have done little to slow the industry's growth. But now the low price of crude is doing just that. The lost revenue has rocked the economy, especially that of Alberta, which last week forecast a record deficit of $6.1-billion for 2015, but the plunge may have silver lining. By stalling investment and putting expansion plans on pause, it is giving scientists time to assess the cumulative impact of industrial development on health and environmental quality, before more projects are built. 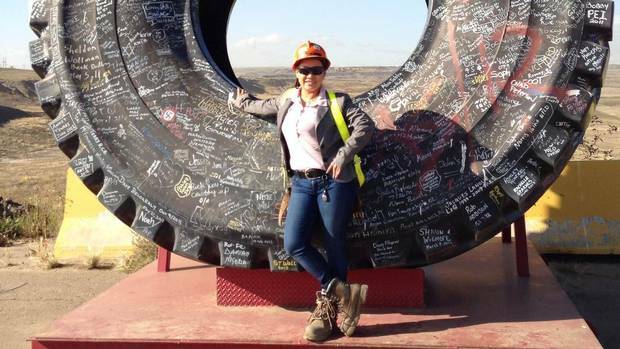 New governments in Ottawa and Edmonton now have a chance to work with First Nations in the oil sands to prepare for the day when a notoriously cyclical industry bounces back. On an even larger scale, as Canada's indigenous population finds itself caught between past and present, the people of Fort McKay face an issue central to that struggle: Resource development offers an economic lifeline – but does it outweigh the detriment to both the landscape and the people's well-being? 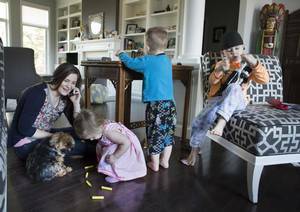 From boom town to family town: Meet the real Fort McMurray Forget oil prices or the environment – the real tension in a maturing Fort McMurray, Peter Scowen finds, is between newcomers looking to cash in and move on and residents who want to build something that lasts. There are no easy answers – even those who benefit from development are torn. "With the industry being here, you can really take advantage of it and get good jobs and make good money," Ms. Mercer explains, but adds, "people are pretty sick – more sick than they ever were before." 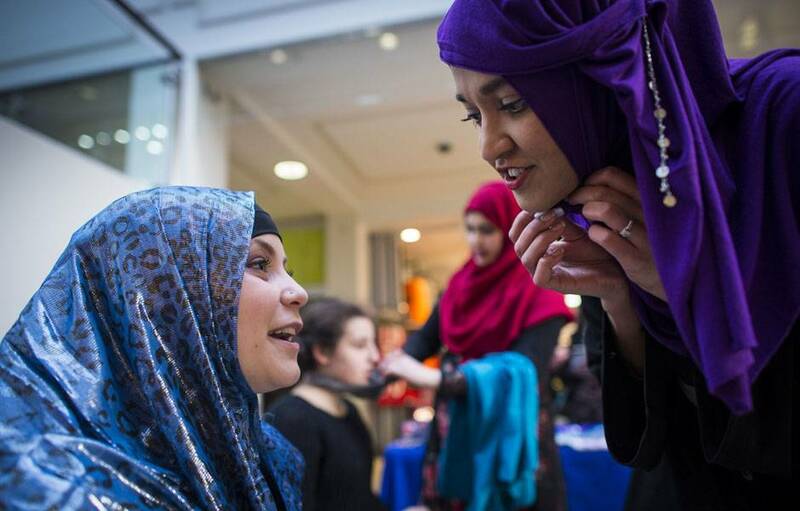 She embodies the paradox facing her community. At 63, she is a respected elder of the Fort McKay First Nation (FMFN) and a storehouse of traditional knowledge; her sons, meanwhile, own a trucking company that does business in the oil sands. But they have also moved away – at least partly out of fear for the health of their children. In many ways, a map best demonstrates both how completely immersed in oil-sands activity the residents Fort McKay are and how much of an imprint the industry has made on the vast expanse of their traditional territory. Resource companies have already leased three-quarters of that land, illustrated by the intricate patchwork of ‘linear disturbances’ – access roads and lines cut through the forest in the quest for bitumen. Visible from space, they are known to disrupt the wildlife upon which First Nations hunters and trappers rely. Toggle the buttons above the map to show and hide layers. Perched on a hill on the west bank of the Athabasca, Fort McKay spreads out like a hand, with residential streets radiating off a dead-ending main drag. There are few commercial buildings – the lone grocery store shares premises with the post office. Some of the homes are handsome, boasting paved driveways filled with trucks, boats and all-terrain vehicles. In contrast, several streets are lined with townhouses and mobile homes clearly in need of repair – evidence that not all residents enjoy the good life. Fort McKay was established by the Hudson's Bay Company in 1820. Until the oil companies arrived in earnest 150 years later, its people led a largely hunting-and-trapping existence (although Clara Mercer's father also made money fighting forest fires in the summer). The pristine wilderness they inhabited was intimately connected to their culture and spiritual beliefs, but they have had little say in the way that landscape has been developed. That must change, say both the leaders of Fort McKay and those of bands farther down the river. They are demanding at the very least a say in the decision-making, if not a veto over proposals that affect them. And their increasing militancy comes at an opportune time. Sworn in this week as Canada's 23rd Prime Minister, Justin Trudeau promised during the election campaign to give aboriginal peoples a greater say over resource development in their traditional territories. In his victory speech, he expressed his desire for "a renewed relationship … that respects their rights and honours their treaties." His new ministers – Catherine McKenna in Environment, Jim Carr in Natural Resources and Carolyn Bennett in Indigenous and Northern Affairs – will be tasked with keeping that promise. Concerns in local communities about the oil sands are spurred by the knowledge that, as rapid and extensive as development has been, industry proposes to double, even triple production over the next 15 years. The oil sands cover an estimated 140,000 square kilometres (the size of New York State), and the province has issued leases to energy companies covering 93,000 square kilometres. The sheer scale has alarmed not just some First Nations communities but many in the scientific community. This summer 100 researchers and academics issued an open letter calling for an official moratorium on all new projects that fail to meet four prerequisites: To be viable, they say, projects must dramatically reduce greenhouse-gas emissions, safeguard biodiversity, respect indigenous rights and protect people's health. In the increasingly global debate over the sands, the first fear factor – climate change – inspires much of the opposition. Compared with conventional oil, the extraction and refining of bitumen is highly energy-intensive (the in situ plants use huge boilers fired with natural gas) and produces considerably more greenhouse gases. 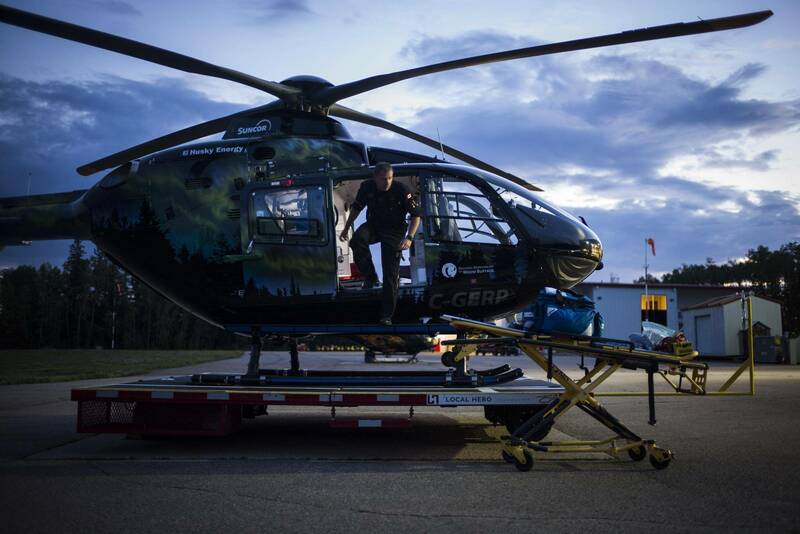 Long-promised helipad for Fort McMurray hospital mired in delays As plans stall and are reassessed, Renata D’Aliesio reports, physician and transportation officials claim problems in getting patients to the city’s health centre have resulted in deaths. But the health impact is the chief concern of people in Fort McKay. They complain of rashes and asthma; they report elevated rates of rare cancers and worry about an apparent increase in the number of premature births. The pristine wilderness is such a distant memory that they now must drink bottled water, no longer eat fish from the Athabasca River and have been warned to take short, lukewarm showers to avoid skin problems. The elders also fear the oil industry's relentless march is destroying the plants and animals that have sustained the Cree and Dene since time immemorial. Far more than Clara Mercer's berry patch has been "all torn up." In addition to the acreage directly affected by mines and wells, much of Fort McKay's traditional territory has been touched by industry activity. It now bears the scar tissue of gas and oil exploration, from access roads to lines cut through the forest for seismic testing – lines that make the area resemble a giant sheet of graph paper from the sky, while on the ground, they are blamed for disrupting migration patterns of the endangered woodland caribou, which won't go near them, and providing quick-access routes for predators. Ms. Mercer says she is "very worried" that "by the time it's the younger generation's time to hunt and fish and gather for their families, everything will be gone." 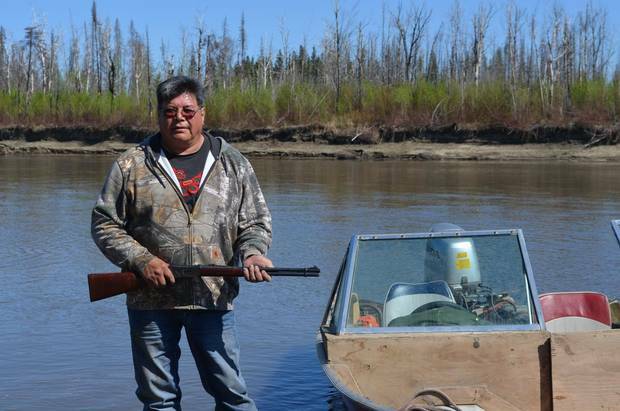 Roy Ladouceur hunts for moose along the Athabasca River, near Fort Chipewyan, Alta. The debate over how bad things really are and who is to blame has raged for years. 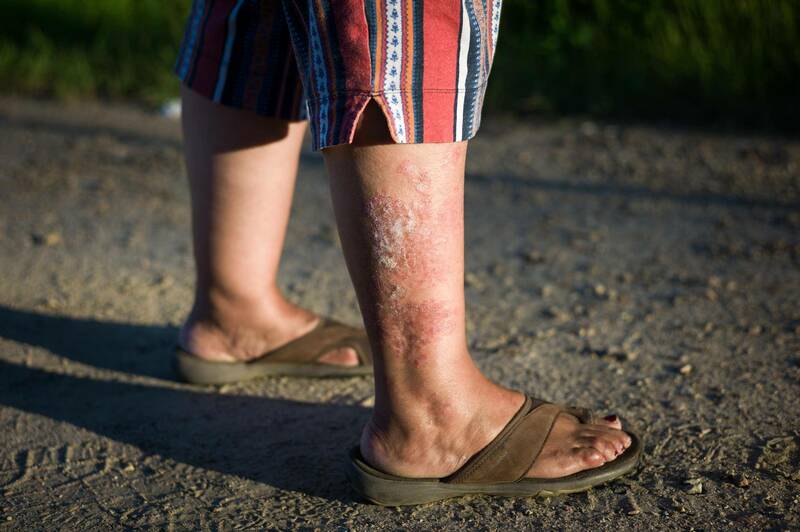 Many in Fort McKay are certain there is a cause-and-effect relationship between toxins produced by oil extraction and health issues such as higher rates of cancer, but the connection is hard to prove. For example, water and fish from the Athabasca are increasingly suspect due to their high toxin levels, but the pollution has many possible sources: Part of the Arctic watershed, the river flows more than 1,200 kilometres north from the Rockies to end in a sprawling delta near Lake Athabasca. Along the way, it picks up effluent from pulp mills, runoff from farms and municipal discharge from communities such as fast-growing Fort McMurray, whose population has nearly doubled (to almost 80,000) in the past decade. Oil-sands operations, meanwhile, are prohibited from discharging waste into the river, and contain their waste water in massive "ponds." Also, residents of indigenous communities are prone to other health risks. Studies have shown that they often smoke heavily, and have poor diets that lead to high incidence of diabetes – something their leaders attribute in large measure to the loss or adulteration of their traditional food sources. In their defence, industry executives note that every oil project undergoes an environmental assessment before being approved by the Alberta government. Also, companies are spending billions to monitor and mitigate their impact. They promise to restore the landscape and limit the growth of their holding ponds, which now cover a combined 176 square kilometres – half the surface area of B.C. 's Lake Okanagan. But the ponds are rarely far from the Athabasca and suspected of leaking into the river. So, who is right? To settle the issue, an army of scientists is spending millions of dollars on scores of research projects. They are trying to determine the true state of the air, the water, the flora and fauna, as well as assess industry attempts to do less harm. But each study provides a mere snapshot of one aspect of the environment, and some scientists argue that the long-term impact of such massive industrialization has not been properly assessed. Some researchers – and many in the First Nations communities – fear that, by the time science arrives at conclusive evidence, the battle will have been lost. Biologist John Smol is one of those calling for a moratorium. He holds a Canada research chair in environmental change, served on a federally appointed committee that was highly critical of past environmental monitoring in the region and co-authored a 2013 report on increasing levels of industrial pollution in the sediment of area lakes. In an interview from Queen's University, he says that the number of chemicals being released and the sheer increase in volume as oil production grows are reason enough to worry. "My view is we should be on the cautious side – once it's outside the toothpaste tube, it's gone," he says. "We're nowhere near acting on the cautious principle yet, and I think it is a quite serious issue. If we have to wait to prove there's the problem, then it's too late." The site not far from Wood Buffalo National Park where a July 2015 oil spill by the Nexen corporation left five million litres of oil covering an area of forest and muskeg the size of three football fields, as seen on August 8, 2015. Fort McKay First Nation is not the only indigenous community affected by development – oil extraction has crept ever northward along the Athabasca (bitumen near the river is closer to the surface and easier to reach). The others are Dene and Cree bands downstream in Fort Chipewyan, the historic fur-trading post on Lake Athabasca that was once Alberta's largest town. They blame industrial development – on the Peace River as well as the Athabasca – for the demise of commercial fishing on Canada's eighth largest lake and for altering the ecology of the vast delta into which both rivers drain. The Dene, officially known as the Athabasca-Chipewyan First Nation (ACFN), have joined forces with such vocal opponents of the "tar sands" as Hollywood actor Leonardo DiCaprio, director James Cameron and rocker Neil Young, who has performed at benefit concerts for them. Two months ago, at a session in Edmonton on the province's climate policy, ACFN chief Alan Adam called any further development upstream from his community intolerable. "We are the people in the sacrifice zone," he declared. "That has to stop." The neighbouring Mikisew Cree First Nation (MCFN) agrees. This summer, almost 30 years after nearby Wood Buffalo National Park (Canada's largest, and summer home of the endangered whooping crane) was recognized as a UNESCO world heritage site, the band petitioned the UN agency to declare that status at risk. The reason: proposed oil-sands projects near the southern boundary of a park that UNESCO considers "the most ecologically complete and largest example" of the Great Plains boreal grassland ecosystem. Melody Lepine, the Mikisew's director of government and industry relations, went to Bonn in late June for the annual meeting of the UNESCO World Heritage Committee, which called on Canada to hold off on new energy projects while it sends a team to investigate. Shortly afterward, a pipeline near Fort McMurray leaked five million litres, Alberta's largest spill in 35 years, undermining industry reassurances. The bands at Fort Chipewyan want a moratorium on further oil-sands development even though they are 150 kilometres from the action. Fort McKay, of course, is at the epicentre. Within 40 kilometres of the town, companies along the river scoop out nearly a million barrels of bitumen-laden sand a day for processing, and there are also dozens of in-situ projects in the area. Fort McKay residents complain of foul odours and poor water quality, as well as the increased incidence of asthma, rare cancers and premature births. Researchers have found industrial toxins in the area's fish and berries as well as on the bottom of its lakes and in the winter snow pack. But not all its residents agree about how to approach these issues. Fort McKay's elected chief, Jim Boucher, welcomes the opportunities offered by the oil sands, and is touted by company executives as a pragmatic leader who would prefer to negotiate a benefit agreement than battle a development. Mr. Boucher acknowledges the environmental challenges but insists that, on balance, the oil sands have been good for Fort McKay, which average incomes last year exceeded those in the province as a whole. "I think this community is fortunate to some extent that we have an economy, and we're not mired in massive unemployment and poverty, like other northern communities," he says, in his office at the band's impressive headquarters, its walls adorned with mementos and aboriginal art from around the world. He notes that the trapping economy the Cree, Dene and Métis once relied on collapsed a generation ago when the anti-fur lobby essentially killed the market. Resource development, he adds, is now one of the few economic opportunities available to remote communities. Mr. Boucher wears jeans, a sports jacket and a fedora, pulled low on his forehead. He speaks slowly and deliberately, leaning back with his feet up on his desk. He has been in office for much of the past 30 years but narrowly won the last two elections, both against a rival who opposes further development. This spring, he beat Cece Fitzpatrick, whose father was once Fort McKay's hereditary chief, by 21 votes; four years ago, the margin was just one. As well as local government issues, Mr. Boucher oversees the broad direction of the band-owned Fort McKay Group of Companies, which is based in Fort McMurray and primarily services the oil sands but is expanding into other regions. In recent years, booming production and $100-a-barrel oil yielded a windfall. But when crude prices collapsed last year, the party ended. Two years ago, the band earned $80-million from its businesses and benefit agreements with oil companies that operate on its traditional territories. This year, it expects that figure to fall to $30-million. Mr. Boucher says the council will have to review its financial plans in light of the downturn. It had approved projects for the current year that included paving roads, constructing walking paths, installing stone driveways – "like up there in Beverly Hills," he jokes – as well as building a youth centre and a long-term-care residence for elders. He is also keen to maintain contributions to a $45-million trust fund for future generations. "What we need to do is live within our abilities," he explains. "One thing is sure: The economy will always go up and down. You learn to live with the good times and tighten your belt for the bad times." Last year, his pay as chief was $700,000 while three band councillors made almost half that and the fourth $284,500. But some in the community complain that the benefits of development have not been distributed equitably. Ms. Fitzpatrick describes a growing divide between "haves" and "have-nots" (the latter including many who are critical of the band council). She says her late sister, Dorothy McDonald, who was chief in the 1980s and 1990s, demanded better terms from the then-fledgling oil producers. Now, "we tread on eggshells with industry to make sure we get our contracts, but the people are never the priority," she adds. "We're not rich by any means in Fort McKay. Our kids are in poor health … We'll wake up one day, and it will be too late." Terry “Sonnyboy” Courtoreille, left, and Maurice Aaron McDonald check and reset beaver traps near Fort McKay, Alta., in August 2015. McDonald, an experienced fur trapper, was hired by Suncor to trap “problem beavers” along industry roads. Despite his reputation for getting along with business, Mr. Boucher criticizes Ottawa and the province for approving development with little or no indigenous input. When the provincial Progressive Conservatives were still in power, they adopted a new regional plan, despite complaints that it allows development to take precedence over treaty rights and environmental protection. But with the Athabasca River now polluted, Fort McKay First Nation is determined to protect territory it has about 100 kilometres northwest of town, on the shores of Moose Lake. One of the few remaining wilderness areas left to band members, it is where they go to hunt, trap and fish. Because their ancestors are buried there and some of their elders were born there, the land is considered sacred. Yet, in 2008, an oil company applied to the province to extract up to 250,000 barrels a day within a few kilometres of the shoreline. A joint effort in which China's state oil company has controlling interest, the Dover project, as it is known, will be in situ, using steam to extract the bitumen. This is less disruptive than hauling off the sand for processing, but still requires access roads, pipelines and gas-fired generators for the steam, all of which may threaten the area's moose and caribou, if not contaminate the groundwater. After the Alberta energy regulator approved the proposal, Fort McKay's council launched legal action, sparking fears in the industry that relations with the band had soured. But early last year, the dispute was resolved. While specific details were not disclosed, the project will go ahead, significantly distanced from the lake and with financial benefits to FMFN. Then, in February, the province and the band reached a broader deal that Mr. Boucher says allows "us to look at how development will proceed in that area, so that Moose Lake itself will … not be impinged in a negative way at all." Dez, 7, was born with an underdeveloped heart and has received multiple open heart surgeries. His family and healthcare professionals in Fort McKay believe that his condition was caused by environmental pollution. Back in Fort McKay, however, people worry about what industrialization is already doing to their health. For years, they have asked governments to investigate and provide some answers, to no avail. So, now the band is paying for a study of its own – which some in the community say it should have done years ago. To lead the research, the council has enlisted John O'Connor, who runs the family medical clinic in Fort McKay and has long raised concerns about the impact of oil-sands development. In his practice, Dr. O'Connor has seen everything from serious rashes to breathing problems and elevated cancer rates, but says it's still impossible to state definitively that oil development is to blame. He also wonders how serious the authorities – from industry and government to the band council itself – are about a definitive answer. "There's a feeling of, 'Do we really want to know?' " he says. "That would be a game changer: If any study does come up with evidence that there is a very close relationship between health problems in the community and what the community has been exposed to, they'd have to deal with it." Success eludes recent migrants as Fort McMurray braces for TFW fallout For more than a decade, migrant workers have kept Alberta communities such as Fort McMurray humming, but new temporary worker rules and plummeting crude prices are in step with the shedding of staff. Colin Freeze reports. And the opposite is equally true: A study that rules out a link between the oil sands and health effects will reduce the leverage local communities have when pressing industry for assistance. The bands at Fort Chip have already conducted a study of their health. Released a year ago, it showed elevated levels of industrial contamination in the organs of moose, duck, muskrat and beaver, all staples of the traditional diet. Such pollutants are emitted by the oil sands, but, again, other sources are possible. The peer-reviewed study was led by Stéphane McLachlan, a professor in the University of Manitoba's Department of Environment and Geography who found an increased incidence of rare cancers in people who have worked in the oil sands or rely on fish and game for their diet. He feels there is enough evidence to implicate the industry. Dr. O'Connor says the report raises "very interesting and valid points." But "we're far from being in a position where any conclusions can be drawn," he says. Ryan Abel of the Wood Buffalo Environmental Association checks data at an Environment Canada air quality monitoring station in Fort McKay, Alta., in September 2014. Many of those Dr. O'Connor is to study, however, already take it as an article of faith that they are being poisoned – by what they breathe as well as what they eat and drink. To get a handle on its exposure to industrial air pollution, Fort McKay is working with the Wood Buffalo Environmental Association (WBEA), a nonprofit group whose board includes representatives of First Nations, oil companies and activist organizations. Band employees help to operate the equipment, which also feeds real-time data to the association's office in Fort McMurray. It records frequent spikes in such toxins as volatile organic compounds, sulphur dioxide and nitrogen dioxide, as well as polycyclic aromatic hydrocarbons, typically accompanied by a sour-egg odour emitted by nearby mines and upgraders that refine bitumen into light synthetic crude. Celina Harpe, an elder in the community, says the smell "makes me sick," and regularly drives her indoors with a headache and sore throat. The trouble is that, even though the foul scent can last for hours, the exposure to pollutants rarely exceeds Health Canada guidelines, says WBEA executive director Kevin Percy, a former federal scientist with 40 years of expertise in air pollution and climate change. However, he adds, the official standards take into account neither the witch's brew of toxins being emitted in the oil sands nor the fact that no one really knows what chronic exposure to low levels does. In the past six years, Suncor and Syncrude have spent huge sums to battle the smell by reducing emissions of sulphur and nitrogen dioxide at their plants near Fort McKay, but the problem still occurs on a regular basis. "We have definitely indicated to the provincial government that the odour threshold is too high," Dr. Percy says. Containers filled with drinking water in the entrance of a home in Fort McKay, Alta. While residents used to drink directly from the nearby Athabasca River, now they can not even consume the treated tap water. Although the band is helping to test the air, water is another matter. Until recently, the industry itself tracked the quality of the Athabasca and its tributaries. But indigenous people, environmentalists and the scientific community had little faith in that effort. Following a scathing 2010 report on the system, Ottawa and the province established a $50-million, "world-class" replacement they were to manage jointly. Since then, however, the province has assumed exclusive oversight through the Alberta Environment, Monitoring, Evaluation and Reporting Agency (AEMERA), which still receives industry support for its work in the oil sands. All three First Nations refuse to co-operate, arguing that AEMERA was established without their input and gives them no say in how the resulting data will be disseminated. 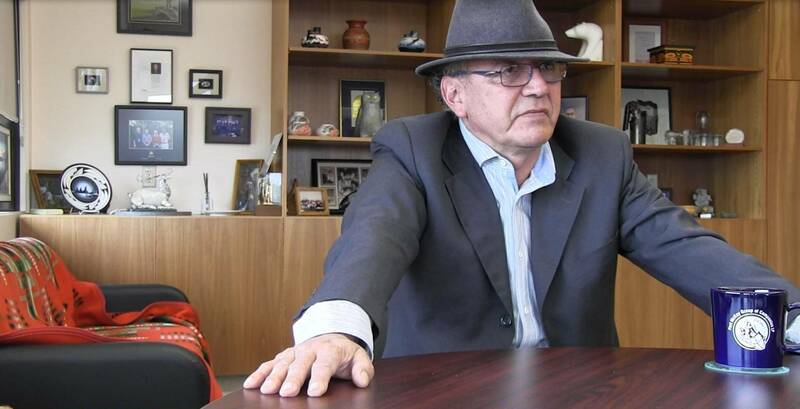 This spring, the agency hired as its chief scientist Fred Wrona, a former Environment Canada researcher who is well-regarded and has worked with aboriginal communities for decades. Despite some criticism that AEMERA has moved slowly, Mr. Wrona says the program is operating at scores of sites, and is now assessing three years' worth of data to determine which of the sites should be maintained. But he also concedes that local residents know the area's complex waterways intimately, and could be of great assistance. "We are asking them: 'What do we need to do … to make sure we are getting the type of information you need?' "
Meanwhile, industry officials insist that, so far, the monitoring indicates that oil-sands projects have had little impact. "We don't see issues in the water quality – we think the transparency is all there," says Greg Stringham, the Canadian Association of Petroleum Producers' vice-president for the oil sands. Yet, several scientific studies in recent years have confirmed rising pollutant levels in the fish, lake sediment and snow pack around oil-sands projects. University of Alberta biologist David Schindler published some of the earliest work on toxin accumulation in snow near the Athabasca River, and his signature is among those of the 100 scientists seeking a moratorium on development. As well, two years ago, Environment Canada reported finding elevated levels of mercury in area lakes, likely produced by the upgraders, which refine the bitumen, and by fugitive emissions from tailings ponds. More samples were collected this year, and federal research scientist Jane Kirk says the focus is on contaminants that can be traced to the oil sands. However, she adds, pollutant levels so far have been lower than those typically seen in Southern Ontario and Quebec – or, in the case of the Peace-Athabasca delta, in a U.S. national park. A robotic bird of prey fitted with a propane cannon, designed to scare away waterfowl, sits in a decommissioned Syncrude tailings pond site near Fort McKay, Alta., August 12, 2015. Findings such as these point up the often uneasy relationship between First Nations and scientists working in the area. Researchers increasingly work with indigenous people both to collect samples and to benefit from their memories of the preindustrial landscape. Indeed, it seems virtually every study now includes a component of "traditional environmental knowledge" – or TEK, as it has become known. But local people are concerned the scientists employ a hierarchy in which academic knowledge always trumps their experience of environmental change. The Mikisew Cree's Ms. Lepine, for example, says AEMERA's water monitoring "is clearly being done for the benefit of development." She grew up in Fort Chip and blames industry for the loss of species in the area (muskrat, for example, have all but disappeared) as well as the shuttering of the Lake Athabasca fishery. Last fall, Alberta banned all commercial fishing in the province, saying it wanted to preserve dwindling stocks. A provincial biologist admitted that Lake Athabasca still has lots of fish, but the quality of that fish is a concern. "We do see the changes in the traditional food," Ms. Lepine says. "The elders say the animals are sick – and they fear that is causing the cancer and other health problems." Blueberries grow wild at the Poplar Point reserve near Fort Chipewyan, Alta., the first community downriver from oil sands developments. What happens when indigenous people lose their connection to the land? Scientists have only an inkling, but the issue is at the heart of anthropologist Janelle Baker's doctoral studies at McGill University. She has worked with Alberta's indigenous communities for 10 years and now, with the support of WBEA, is researching Fort McKay's experience with berries, which she says are more than just a food source. With the help of a dozen elders, Ms. Baker has gathered berries for three years, had them analyzed and found that those picked near town – and the oil-sands projects – have much higher levels of carcinogens and sulphur dioxide than those from faraway Moose Lake. Again, the levels are within Health Canada guidelines, but that provides the elders with little solace. "Years back, my mother used to be able to put 300 or 400 quarts of blueberries away for the winter," says Ms. Harpe, one of the elders assisting Ms. Baker. "Today, we go out and there are only a few little berries here and there." She didn't need scientific analysis to realize the berries are suffering; the colour, dust and lack of plumpness said it all. Ms. Baker says the study points to how industrialization has fundamentally disrupted indigenous people's relationship with their environment. "Because their spiritual system isn't separate from their way of observing the land, their definitions of contamination are a lot more complex, too," she says. "There are spiritual components to contaminating the land, and they don't see those things as separate." Athabasca Chipewyan First Nations member Marvin L’Hommecourt grew up on the Athabasca River but won’t eat the fish there now. He works as a heavy equipment operated for Imperial Oil Ltd.’s Kearl oil sands project. Marvin L'Hommecourt also worries that his children and grandchildren are losing their cultural traditions. Burly with a broad, sun-burned face, Mr. L'Hommecourt is a member of the Athabascan-Chipewyan First Nation, and has a foot in both worlds: He operates heavy machinery for Imperial Oil Ltd. at its new Kearl oil-sands mine northeast of Fort McKay, but continues to run his trapline and hunt along the Athabasca River. He has welcomed the work provided by the oil sands but now, like Clara Mercer and so many others, questions the scale and pace of development. A residential-school survivor, Mr. L'Hommecourt says he traps and hunts because he likes solitude and wants to remain connected with his traditional culture. But he, too, has seen that culture erode: The wildlife is in decline; his furs – lynx, marten and beaver – are worth a fraction of what they were when he was a boy; and he will no longer eat fish from the Athabasca because the flesh is soft and unappetizing – something he also attributes to industrial activity. The scale of that activity is evident as he boards a motor boat in Fort McKay, where he has cousins, and heads north down the Athabasca toward Fort Chip, where his band is based. The river is a long ribbon that runs through wilderness punctuated by development. Less than 10 kilometers back upstream, Syncrude Canada Ltd. has its original mine, its bitumen upgrader and large tailings ponds. Just to the southeast is Suncor Energy Inc.'s base mine, upgrader and ponds. Travelling downstream, he passes Canadian National Resources Ltd., Royal Dutch Shell PLC, and Imperial Oil Ltd., as well as new Syncrude and Suncor operations – the presence of all of which will be a scar on the landscape for at least a generation. "We've got to slow it down," Mr. L'Hommecourt says of the industry's growth. "They just keep grabbing and grabbing and grabbing, but they've already got enough there to last them for 50 years." The river is unusually shallow for this time of year, with brownish foam swirls in the eddies. The steep banks show the black stain of natural bitumen that can ooze into the river. At regular intervals, there are signs of industrial activity: a water-intake pipe, transmission lines that cross the river, even a small construction site providing access to the river for the project, where he works. When he reaches Poplar Point, halfway to Fort Chip, Mr. L'Hommecourt drops off two friends who are spending the weekend there on land the ACFN has along the river. The place is special to him. He was born there, has happy memories of growing up among friends and family, and he returns on a regular basis. Heading north again, he rounds a bend and spots a yearling moose standing knee-deep and having a drink. "I'm going to get him," he says. Putting the motor in neutral, he pulls his .30/.30 hunting rifle from its case and takes four shots. Mortally wounded, the animal staggers into the bush and collapses. Back at the camp, Mr. L'Hommecourt recruits his friends to help him skin and butcher. The Dene are excited and relish the feast to come, but worry about the future. They know that Canada's largest mining company has applied to launch a "truck and shovel" operation that will carve 200,000 barrels of bitumen a day from what would be the oil sands' northern-most mine. Recently, the low price of crude prompted Teck Resources Ltd. to hit pause, announcing a five-year delay. But the company has not withdrawn its application for the project, which would cost no less than $20.6-billion and operate for roughly half a century. And where will the big mine be? Right across the river from Poplar Point. Shawn McCarthy is The Globe and Mail's global energy reporter, based in Ottawa. Alberta’s oil-sands deposits represent the world’s third largest reserves of crude, behind those of Venezuela and Saudi Arabia. An estimated 166 million barrels could be commercially extracted. The sands fall into three distinct regions: Athabasca, the largest and most heavily developed, runs north from Fort McMurray; Cold Lake, with some major projects, lies to the south and Peace River, the smallest, to the west. All three contain bitumen, a heavy, syrupy form of crude oil trapped in sandstone. About 20 per cent of the bitumen is near enough to the surface that it can be mined, using some of the largest machinery in the world. Hot water is used to separate the bitumen from the sand. The remaining 80 per cent must be removed, leaving the sand in place. These “in situ” operations typically use high-pressure steam to loosen the bitumen, so it can pool and be pumped to the surface. Before refining, bitumen must be “upgraded” to form a synthetic crude oil (syncrude), or diluted and shipped to specially equipped refineries for processing into such products as gasoline and heating oil. It is heated and sent to drums where excess carbon (petroleum coke) is removed. The superheated hydrocarbon vapours from the coke drums are sent to fractionators where vapour condenses into naphtha, kerosene and synthetic crude that is shipped by underground pipelines to refineries across North America to become jet fuels, gasoline and other petroleum products. The mines produce vast quantities of waste water that must be stored in tailings ponds. But because of the energy required to fuel their boilers, greenhouse-gas emissions from in situ operations tend to be higher (per barrel) than those from the mines. Total oil sands production averaged 2.2-million barrels a day last year, of which 912,000 barrels were from mining and 1.2 million from in situ projects. The Canadian Association of Petroleum Producers forecasts production as high as four million barrels a day by 2030. Under one roof: Fort McMurray’s Muslim community plans an ambitious, multicultural mosque It’s a $50-million, 10-acre complex – a brand new home for Fort McMurray’s Muslim community, breaking ground this spring. As Colin Freeze reports, it’s also an experiment in multicultural Islam on an unprecedented scale.